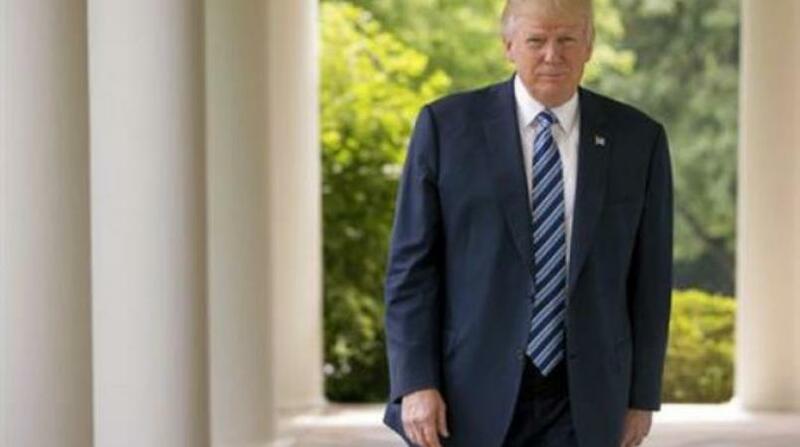 Young immigrants brought to the U.S. as children and now here illegally can "rest easy," President Donald Trump said Friday, telling the "dreamers" they will not be targets for deportation under1 his immigration policies. "I want the border wall. My base definitely wants the border wall," Trump said in the Oval Office interview. Asked whether he would sign legislation that does not include money for the project, he said, "I just don't know yet." Throughout the campaign, he had firmly and repeatedly guaranteed that Mexico, not U.S. taxpayers, would pay for the wall. Eager to start making progress on other campaign promises, Trump said he would unveil a tax overhaul package next week — "Wednesday or shortly thereafter" — that would include a "massive" tax cut for both individuals and corporations. He would not provide details of rate proposals or how he planned to pay for the package but asserted the cuts for Americans will be "bigger, I believe, than any tax cut ever." Congressional Republicans seemed caught off guard by Trump's announcement and did not appear to have been briefed on the details of the White House's forthcoming plan. He panned that marker as "artificial." Still, the White House is eager to tout progress on the litany of agenda items he promised to fulfill in his first 100 days, despite setbacks including court bans on his proposed immigration limits and a high-profile failure in repealing and replacing the current health care law. The president said Friday he spent his first 100 days laying the "foundation" for progress later in his administration, including by building relationships with foreign leaders. He cited German Chancellor Angela Merkel as a leader he was surprised to have developed strong chemistry with, given that he has been critical of her handling of immigration policies. As a candidate, Trump strongly criticized President Barack Obama for "illegal executive amnesties," including actions to spare from deportation young people who were brought to the country as children and now are here illegally. But after the election, Trump started speaking more favorably about these immigrants, popularly dubbed "dreamers." On Friday, he said that when it comes to them, "This is a case of heart." This week, attorneys for Juan Manuel Montes said the 23-year-old was recently deported to Mexico despite having qualified for deferred deportation. Trump said Montes' case is "a little different than the dreamer case," though he did not specify why. The Deferred Action for Childhood Arrivals program was launched in 2012 as a stopgap to protect some young immigrants from deportation while the administration continued to push for a broader immigration overhaul in Congress. Obama's administrative program offered a reprieve from deportation to those immigrants in the country illegally who could prove they arrived before they were 16, had been in the United States for several years and had not committed a crime since being here. It mimicked versions of the so-called DREAM Act, which would have provided legal status for young immigrants but was never passed by Congress. DACA also provides work permits for the immigrants and is renewable every two years. As of December, about 770,000 young immigrants had been approved for the program. On foreign policy, Trump said it was "possible" the U.S. will withdraw from the nuclear accord with Iran forged by Obama and five other world leaders. He said he believes Iran's destabilizing actions "all over the Middle East and beyond" are violating the spirit of the accord, though the State Department this week certified that Tehran is complying with the tenets of the deal aimed at curbing its nuclear program. The president also appeared to side with his advisers' increasingly harder line on Julian Assange, the founder of WikiLeaks. Attorney General Jeff Sessions said Assange's arrest was a priority for the Justice Department as it steps up efforts to prosecute people who leak classified information to the media. The president said that he was not involved in the decision-making process regarding charging Assange but that the move would be "OK with me." During the campaign, Trump and his allies publicly delighted in WikiLeaks' release of stolen emails from a top adviser to Democrat Hillary Clinton. FEATURED IMAGE CAPTION: President Donald Trump walks along the West Wing Colonnade at the White House in Washington, Friday, April 21, 2017. Young immigrants brought to the U.S. illegally as children can "rest easy", the president said Friday, telling the "dreamers" they will not be targets for deportation under his immigration policies. Trump, in a wide-ranging interview with Associated Press, said his administration is "not after the dreamers, we are after the criminals."